This is a tragic tale. Last fall I went to the Experience Music Project in Seattle. While there I bought my son a very fun shirt with a picture of Bob Marley on it and a caption that says “B is for Bob” (like this one) . He loved it and it quickly became his favorite piece of clothing. This is where it gets tragic. 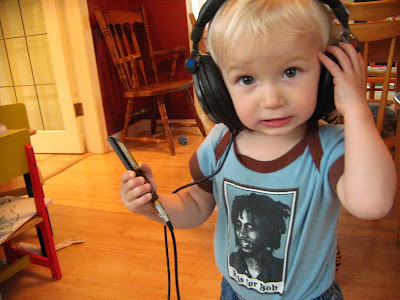 One day, the (seriously fantastic in all respects except this one) daycare workers at his daycare saw him wearing his Bob shirt and heard him fumbling out the lyric, “don’t worry”. For some reason, they filled in the next line with “be happy.” As in don’t worry, be happy by another Bob – Bobby McFerrin. So now they have gone one step further and, thinking that Graeme loves that song, have got it on a CD and are playing it in the daycare in high rotation for him. He is being brainwashed by Bobby McFerrin. Now, Bobby McFerrin is a mighty fine musician in his own right and has produced some excellent music beyond the unfortunate phenomenon that was Don’t Worry, Be Happy. But he ain’t no Bob Marley. And now somehow my son is getting it into his head that Bob Marley sings “don’t worry, be happy.” And THAT, my friends, is a tragedy.